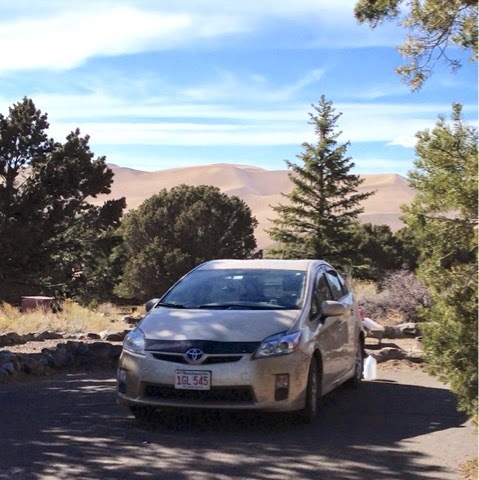 I drove Sunday am across the wilderness of north central New Mexico before heading north over the mountains into Colorado. 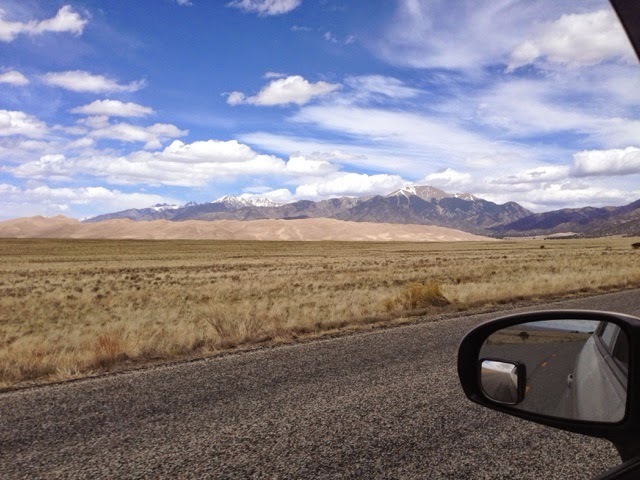 I made it to Alamosa, CO where I found my first McDonalds for the day and wrote my blog yesterday. There I was entertained by a tall man in Cowboy hat, plad shirt and jeans preaching religion to a 20 something male over a counter between them. The young man just kept saying "Yes Sir." This went on for about 15 minutes and the cowboy preacher left. Then a much smaller cowboy got up from the other side of the counter so I couldn't see him before and started to reinforce what the tall cowboy was saying to the young man. Again "Yes Sir"
It's Sunday am in McDonalds In Alamosa, CO. I drove through town on US160 headed east and there were many vintage railroad cars on sidings. Then I saw the covered vintage Denver and Reo Grand train undercover. A bit of train history here. 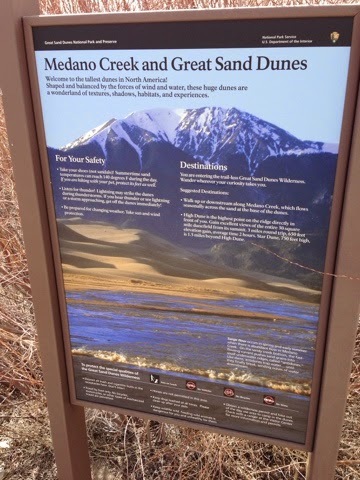 My goal was to get to the Sand Dunes National Park early enough to get a camping site and tour the dunes. 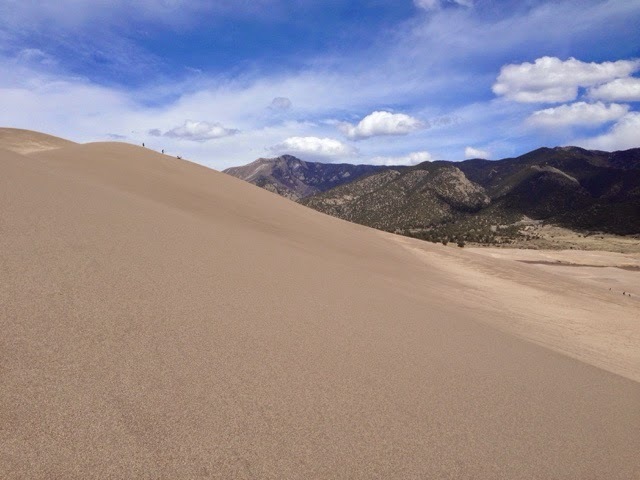 You can see the light sand color dunes at the base of the mountains. 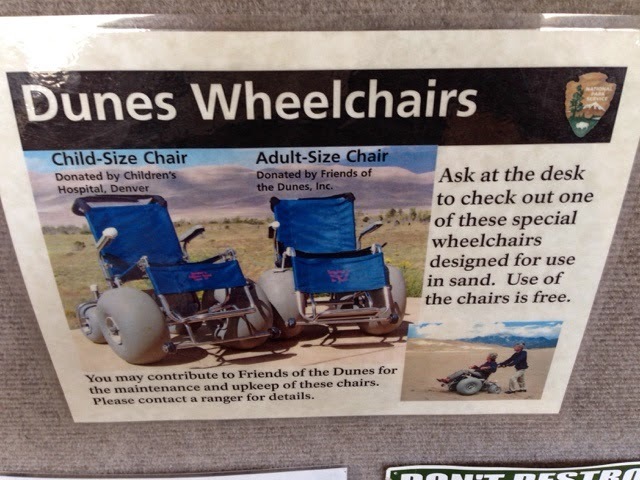 I toured the visitors center and couldn't believe these sand wheelchairs. I got a site for the night but there was no issue as there were plenty open. After May 1 I am told that will not be the case and reservations will be needed. 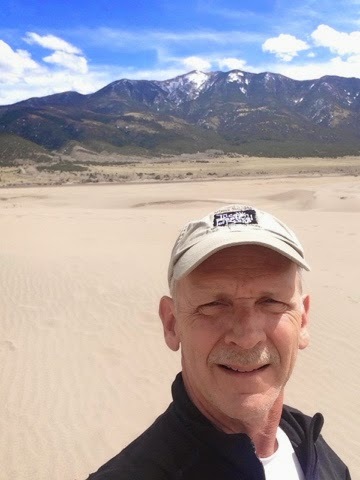 I ventured to the dunes for a hike. 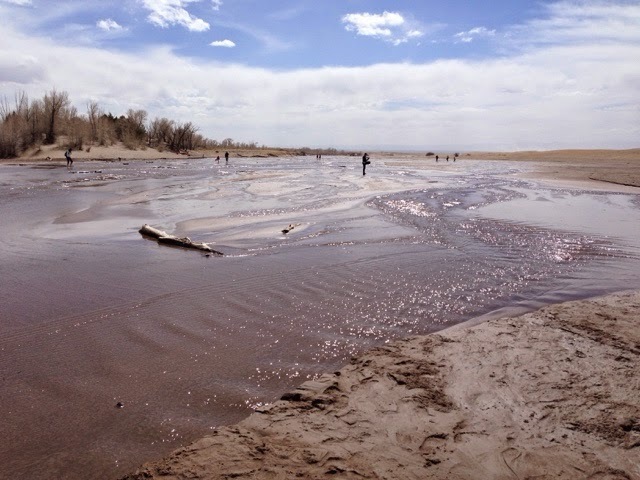 You have to walk across this river to get to the dunes. Bring Rowell to dry your feet to put your shoes back on. 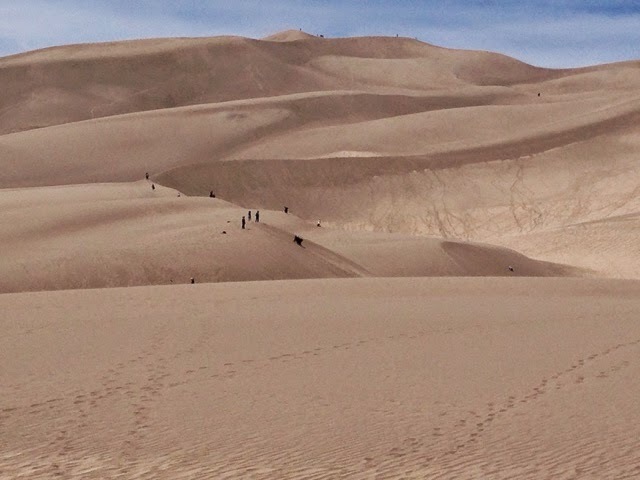 These are no small dunes and I was told they are the tallest in North America. They are hundreds of feet tall. Look at the size of the people. As I hiked up the mounds it got very windy thanks to a low pressure south of here. Look at the sand blowing off the top. 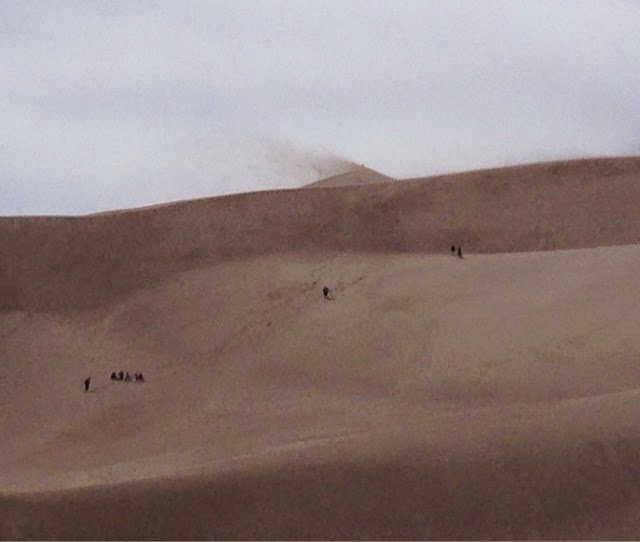 This was my goal, but the blowing and drifting sand took its toll on me as I reached a lower crest. I had wraparound sunglasses (off in this photo as I was further down) and that was good but sand got into my ears, mouth, nose, shirt, pockets, and rolled up jean cuffs, everywhere. My hair was all grit! As I reached the crest my exposed skin was being pelted. Ouch! I gave up on the need to climb to the top peak. If you look to the top right this is the crest I reached where you see two people standing. 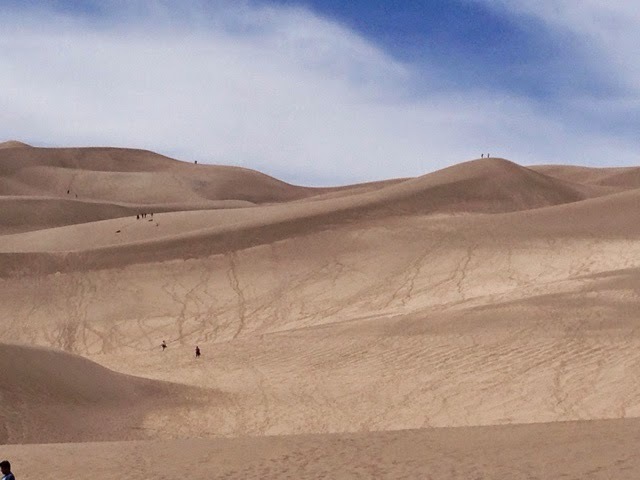 Walking and climbing loose sand is not easy as you take two steps forward and one sliding back all the way. Lots of exercise. Let's go sliding or surfing! 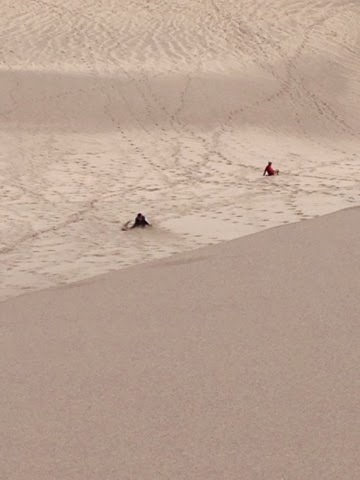 These parents took their children sliding. Older folks tried their hand at surfing/boarding. After leaving the dunes and back at camp there are no showers so it was a full washing. When I washed my hair the pan had sand pooled at the bottom. Yes a second rinse got out more. Although it was a bit rough with the wind it was a good time and a great place to bring children and let them run, play and bring something for them to slide on. 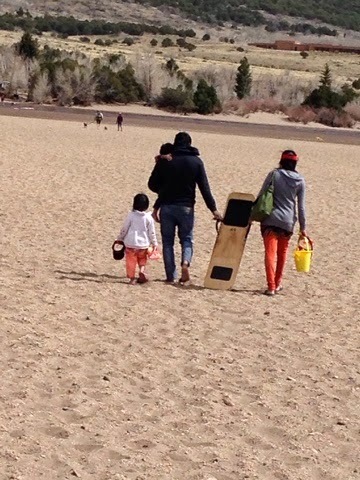 I saw the plastic snow sleds being used too.